The Getaway resort is set within 2 and a half acres of beautiful native gardens and wonderful outdoor facilities. 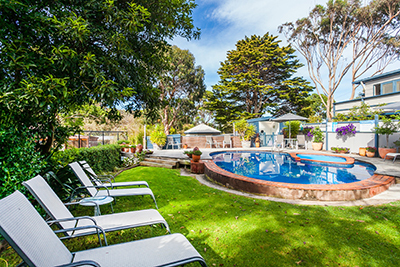 We are the only accommodation in Aireys Inlet with both a swimming pool and outdoor heated spa, plus a Plexi-pave tennis court. This provides all year round entertainment and enjoyment for all, after those wonderful days on the beach. You can hear the sounds of the nearby oceans rolling waves, as you relax on your balcony and watch the spectacular sunset. Or get closer to nature and hand feed the friendly local native bird life such as King Parrott`s, Rosella`s or Cockatoos, maybe just listen to the laugh of the Kookaburra`s or screech of the magpie`s. Kids and adults alike just love it. 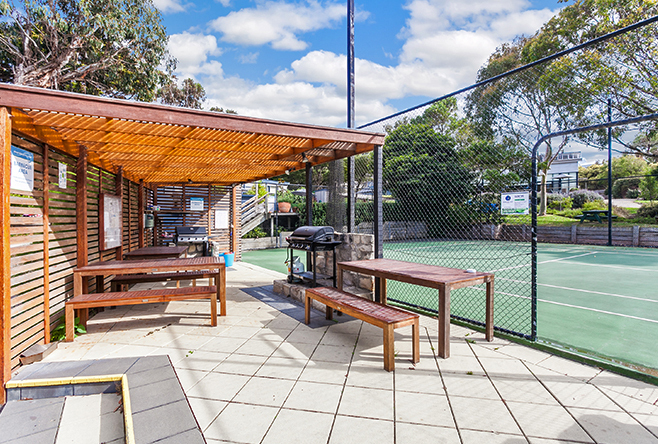 Enjoy a BBQ with friends in our outdoor b-b-q area, all utensils are provided. Allow the kids to go to fantasy land on our play-boat, pretending that they are fishing or hunting for treasure! Play a game of tennis or basketball or even practice your netball goaling! Maybe enjoy the sun on our wonderful swimming pool deck, while keeping an eye on those in the pool, or take a nap on the sun loungers in the garden, or just have a well-deserved refreshing swim or outdoor heated spa. How about reinvigorating your-self in our outdoor spa or your indoor spa. Ask our manager Sue to book ( in advance) you in for an indulgent massage from one of the Local Massage services in town, or just relax with a glass of wine or hot chocolate on the sofa by the fire, with a good book or one of our many movies or board games available from Reception (find masseuse contacts on our activities page). 2 and a half acres of beautiful native and landscaped gardens. Full sized, all year round, Plexi-pave Tennis court, with basketball ring. Beautiful gardens, with gently meandering landscaped. Office facilities available at Reception: fax, phone, computer. A large collection of books, board games and movies available from Reception. Sports equipment available from Reception, including basketballs, tennis equipment. Massages and beauty treatments, can be organized through reception, (please book well in advance) as they are outside of the Resort grounds. Meals can now be ordered via a phone call to Onda, one of our new cafes in town. Meals can be delivered to your door. ( limited days and times).